It's my first attempt at a face off between two beers. As of this writing, the Enigma FPPA was just released today, November 21st. I already had the Galaxy FPPA chilling in the fridge and figured this would be a fun comparison. The base beer is the standard FPPA which is brewed with Citra and Columbus hops. Trillium has cranked out multiple dry-hopped variations such as these two, but also a Mosaic and a Double Dry-Hopped version. Dry hopping is when a brewer adds hops between fermentation and packaging in order to enhance the aroma of a beer. Naturally when you enhance aroma, you will also enhance taste. I've also never reviewed either of these on the blog, but I have had the Galaxy version multiple times, so I might as well throw in my reviews here while I'm at it. I mean, for this case, the beers are the same in terms of appearance. It's a hazy orange with a finger of white head. Fresh hop bitterness, citrus juices, orange/orange peel. This hop is new to me, but it has a distinct mint or green tea smell to it with even fresh-cut cedar. The Galaxy hops are bringing a fresh hop juice and dank quality. Some more of the citrus and orange from the aroma shines as well which reminds me of a glass of fresh-squeezed orange juice. That dankness though is just as big (if not bigger) and gives the sensation of drinking weed. Intense bitterness on the finish with some more lingering dank qualities with a final kick of orange and even some lemon peel for good measure. Very nice. Like the aroma, fresh mint and tea are prominent, but not overpowering. I previously reviewed Trillium's Polaris which utilized (as the name suggests) Polaris hops. I would call the Enigma FPPA a dialed-down version of those hops. There's somewhat of an odd-tasting sawdust flavor to this. It doesn't turn me away, but it does make me do a double take. There's maybe even just s touch of pine or tree sap hidden in the depths of this one too. Like the appearance, these two are again, basically the same in this category. They are nice and full with perfect amounts of carbonation with no alcohol presence. The dank hop qualities and citrus worked together beautifully and made this an easy-drinking experience with tons of flavor. 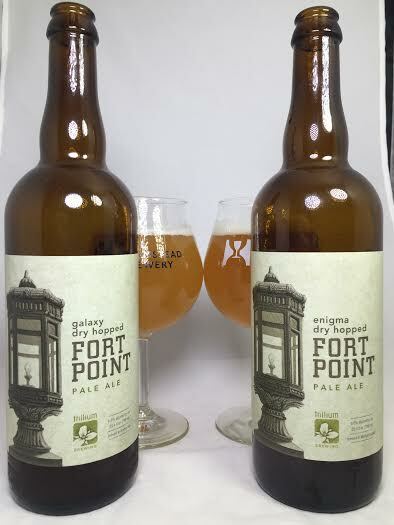 Elements of the standard FPPA were present throughout, but the addition of Galaxy added complexity to a style that is typically just a glass of hops. It's an incredibly hoppy and juicy pale ale worth seeking out. The flavors I encountered actually worked well in this pale ale, but they did seem to conceal a lot of the orange and citrus that the base FPPA usually provides. Don't get me wrong, the green tea, mint, pine, and bitterness did make for an interesting flavor palette and the beer was still highly drinkable, but I wish it didn't mask the natural fruit juices of the standard Fort Point Pale Ale.